In 1920, George Salinas began moving the families and businesses of San Antonio, Texas, one of only three local moving companies in existence. Four of his sons carried on the moving business tradition, passing on the company name & trade to the Salinas sons. 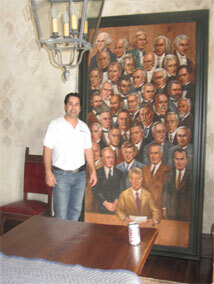 After 2 generations, George’s grandson, Robert Salinas expanded the business lines & opened All-Pro Moving & Storage. Today the Salinas family continues to serve the residents and business owners of Southwest Texas providing full-service moving and storage services on a local and national basis. As a family-owned business, the company takes pride in offering quality and satisfaction to each and every customer. At All-Pro, we know that moving can be a stressful event; therefore, we invite you to try our services for a professional moving experience. Whether you are moving across town or across the country, All-Pro wants to help you make your move as rewarding and stress-free as possible. Of course, no two moves are exactly the same, therefore, you can fill out our free estimate form in order for us to make a thorough assessment of your individual moving needs, and give you a comprehensive and accurate estimate. You can also contact us at 210-820-3027 to schedule an on-site estimate. At All-Pro Moving, we know how important belongings can be. We wrap all of your items securely in clean protective pads, boxes, wrapping paper, and other various high quality packing materials to prevent scratches and other incidental damage as they are being moved. Special attention is dedicated in moving some of your extra fragile and delicate items, upon your request, and at times may add to the cost of your move. All-Pro’s Moving equipment is meticulously maintained and operated by highly skilled professionals. Our modern, fully equipped trucks are specifically designed to help reduce the chance of goods being damaged in transit. We have a large fleet of clean, fully-equipped moving trucks, trained, and courteous personnel, and a reputation for quality in our industry.